The NFL draft is over and it already feels like this latest referendum on college talent has been chopped up every way possible. One of Nebraska's streaks continued (consecutive years with a player chosen), the other (consecutive years with multiple players chosen) did not. A bunch of Huskers found landing spots as free agents. And these latest data points have already served as the source for new trend stories on program health, conference strength and the validity of recruiting rankings. Call that a slight upset. It's no surprise to see California, Florida and Texas up near the top as those have long been the "big three" when it comes to high school football talent. Seeing Georgia top those three qualifies as a mild surprise in my mind. It's not that Georgia has come out of nowhere. When I pulled together 22 years of recruiting data for a story in last year's yearbook I looked at the history of the Rivals250 (2007-16) and Rivals100 (1995-2006) prospect rankings. Those are the top players in the country each year, the 4- and 5-stars, and over that span Georgia ranked fourth in total number of top recruits with 271 players. It was, however, a ways behind Florida (539), Texas (486) and California (485). But there were indications in that data that Georgia was somewhat ascendant as a talent producer. The 2017 draft supported that notion a bit. 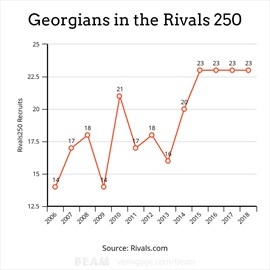 Georgia has a pretty interesting profile based on that analysis of Rivals250 recruits. It's great at producing defensive linemen, which are always in high demand at the college and pro levels. It's tough to top the big three in these tallies as well, but Georgia had more blue-chip defensive ends than any state between 2004 and 2016. It is to defensive ends what California is to quarterbacks. Georgia also ranked in the top three in defensive tackles behind Texas and Florida (by a hair), but ahead of California. The Huskers have two Peach State natives on the roster in 2017, defensive back Aaron Williams and linebacker Mohamed Barry, and both seems poised to play quite a bit. 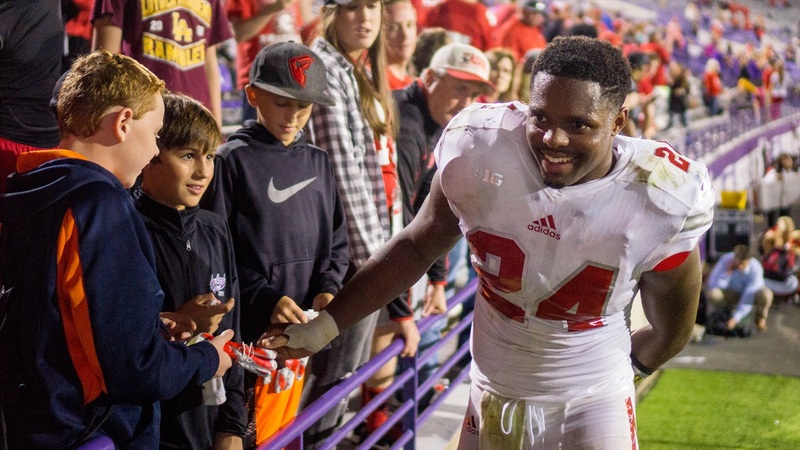 Is it time for the Huskers to redouble its efforts there? Probably not. Georgia, thanks to its location, is uber-competitive. It gets hit by most of the SEC as well as the top powers in the ACC. Eighty-nine percent of the blue-chip players in Georgia ended up in one of those two conferences. It's a tough hill to climb for anyone outside the region. Nebraska can take it's swings -- the Huskers have 10 offers out to Georgia players -- but it's asking a lot for one of those prized defensive ends to fly over the handful of football powers within easy driving distance. One last geography note: It will be interesting to watch what happens with Texas going forward. I don't think there will be any drop off in terms of college talent produced, but as maybe the first and probably the biggest spread-offense incubator, what happens to those players when it comes to the draft? You don't have to look far to find a league source bemoaning the spread's influence of players' pro readiness. Steve Sipple on scrutiny and Tim Miles. Ohio State is the new No. 1 team in the country (according to these post-spring rankings from ESPN). Can bowls be great again?